Pokémon Go: You’re no scrub. You’ve read our beginner’s guide (not to mention our guide on how to dominate the game without spending a dime), and you own the neighborhood gym. But there’s always room for improvement—that’s what being a trainer is all about—so we’ve pulled together some insider tips that will help you on your quest to catching ‘em all. When you first open up Pokémon Go, you get to choose one of three starter Pokémon: Bulbasaur, Charmander, or Squirtle. But, if you’re patient, you can grab Pikachu as your starter Pokémon instead. To do this, simply walk away from the starter Pokémon when they appear on your screen. Walk away until they show up on your screen again (they will respawn in front of you once you’re out of range). Do this three times—walk away, and wait for them to respawn. The fourth time, Pikachu will show up alongside Bulbasaur, Charmander, and Squirtle, and you can catch him by tapping on him. (You can only choose one starter Pokémon, though, so by grabbing Pikachu you will be giving up the other three—for the time being). Tossing Poké Balls is somewhat of an art. But once you’ve mastered the regular toss, you may want to experiment with curveballs, which net you extra experience points (XP)—and, of course, style points. 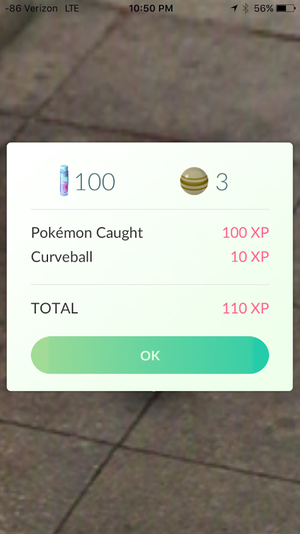 Catching a Pokémon with a curveball will get you +50XP if you manage to nab it on the first toss; +10XP if you nab it on any additional toss. To throw a curveball, hold your finger on the Poké Ball and swirl it around to give it a spin. You will then see little stars start to fly off the ball. Toss the ball while the stars are still shooting—it will curve, so you’ll need to adjust your angle, but that’s sort of the point. You can also get additional XP bonuses for making “Nice,” “Great,” and “Excellent” tosses. To get a “Nice” bonus (+10XP), hit the Pokémon when the circle is at its widest. To get a “Great” bonus (+50XP), hit the Pokémon when the circle is exactly at the halfway point of shrinking (this one is tricky to judge). To get an “Excellent” bonus (+100XP), hit the Pokémon when the shrinking circle is at its smallest. Feeding a Pokémon a Razz Berry will make it warm up to you—which means it will be easier to catch (and less likely to break out of the ball). To feed a Pokémon a Razz Berry, tap the backpack icon in the lower right corner of the screen when you’re capturing a Pokémon, and tap Razz Berry. The Razz Berry will appear on the screen in place of your Poké Ball, and you can flick it toward the Pokémon (no aiming necessary) to give it to them. The Razz Berry will work to lower the Pokémon’s inhibitions until you hit it with a Poké Ball. If the Pokémon escapes your Poké Ball, you will need to feed it another Razz Berry before you attempt to recapture it. Pokémon #133, Eevee, is a cute little fox-type Pokémon with an unstable genetic code. What this means is that Eevee ‘eevolves’ (get it?) into one of three variations: Vaporeon, Jolteon, or Flareon. Eevee’s eevolution is random…unless you use an Easter Egg to choose your eeveelution. 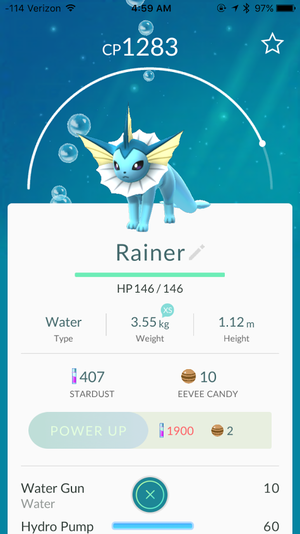 Before evolving your Eevee, change its name to “Rainer” (for Vaporeon), “Sparky” (for Jolteon), or “Pyro” (for Flareon). Then, eevolve your Eevee and you’ll get the corresponding eeveelution. There’s no getting around it: Pokémon Go destroys your battery. After just 30 minutes of catching Pokémon on Santa Monica Pier, my iPhone 6’s battery dropped from 99 percent to 82 percent. 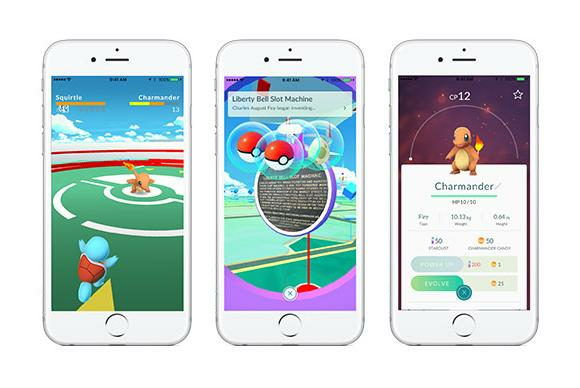 Die-hard Pokémon Go players definitely need a backup battery—but there are also a couple of ways to make the game more battery-friendly. 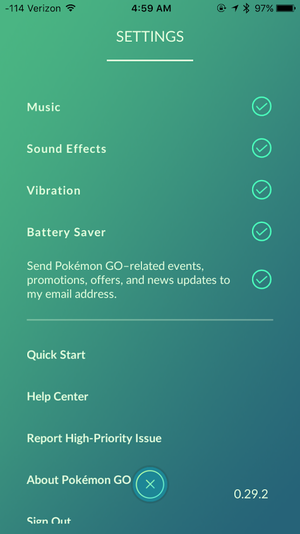 Pokémon Go has a built-in Battery Saver mode that, when enabled, dims your phone’s screen when you point it toward the ground (e.g. if you’re walking casually with it dangling from your hand). Your phone will still buzz if a Pokémon appears nearby, so you won’t miss out on any catching opportunities. To turn on Battery Saver mode, tap the Poké Ball at the bottom of the screen, go to Settings in the upper right corner, and turn on Battery Saver. If you don’t mind giving up some of the game’s augmented reality appeal, you can also save battery life by turning off AR mode. AR mode uses your phone’s camera to make Pokémon “appear” In the real world. When this mode is turned off, Pokémon will appear in an animated forest setting. 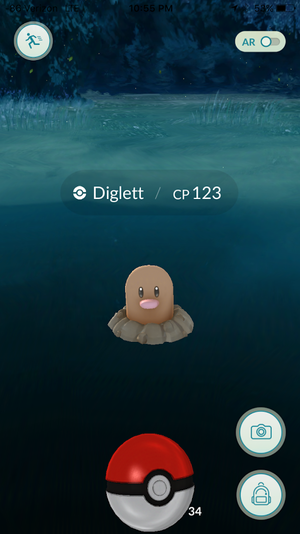 To turn AR mode off, you will first need to find a Pokémon to capture. When the Pokémon is on your screen, tap the ARbutton in the upper right corner of the screen. Increasing your trainer level is important: Higher-level trainers reap the benefits of having higher maximum-CP Pokémon. You will level up just by playing the game, but if you want to level up quickly you can use Lucky Eggs strategically. Lucky Eggs double the amount of XP you get for 30 minutes, and certain actions—such as evolving Pokémon—offer up more XP to begin with. Lucky Eggs are rare (unless you purchase them in the shop), so you will want to plan before you use them. Before you use a Lucky Egg, you will want to “save up” common-type Pokémon evolutions. Pidgeys, Caterpies, and Weedles all require just 12 candies to evolve, so you’ll want to have several of these common Pokémon on hand (along with plenty of their respective candies) so you can evolve as many as possible while using a Lucky Egg. Reddit user bchn has even created a Pidgey calculator where you can input the number of Pokémon and candies you have to see how much XP you’ll get with a Lucky Egg. To take full advantage of your Lucky Egg, you may also want to use a Lure and/or an Incense to ensure that you’ll catch a ton of Pokémon in those 30 minutes. You will also want to make sure your backpack isn’t full (discard items you don’t need, or that you can easily get more of), because you get 50XP (100XP with a Lucky Egg) each time you collect items from a PokéStop. Lure Modules are still a bit mysterious—as is the rest of the game—but it has been suggested, and it’s also my personal experience, that the more people there are at a Lure (or Lures), the more Pokémon will spawn at that Lure. It has also been suggested that higher-level trainers attract rarer Pokémon, and so if you’re at a Lure with a higher-level trainer you may see some neat stuff. The Pokémon that spawn at a Lure spawn for everyone, just at different CP levels based on trainer level—for example, the other day I was at a Lure and a 1000+ CP Flareon appeared for me (I’m level 17), but a 600 CP Flareon appeared for the kid next to me, who was level 11. Can’t find a perfect trifecta of overlapping PokéStops? No worries—look for a line of PokéStops (a historic trail is perfect) and walk between them. You’ll grab new Pokémon at each Lure and you’ll hatch your eggs in the process. Plus, if you’re using Incense to attract Pokémon to your person, you’ll have more luck if you’re moving than if you’re standing still.